I just bought a home in the southwest USA and the water quality is bad. The water is very calcium mineral rich and has chlorine. It makes all the shower heads and the faucets have a white hard calcium coating. I believe this is hurting my plumbing and makes it hard to clean anything without leaving water spots. Is there a way to somehow make the water run through a water filter before it comes into my house? Is there a solution to removing the hard water or a way to “soften” the water? To completely remove hard water, minerals, magnesium, calcium, and chlorine coming into your home, you need to install a water softener. This will filter your water so the minerals are removed before it gets to your showers, ice maker, faucets, dishwasher, and washing machine. A water softener will make it so the water in your home does not leave hard water spots anymore. It will leave your skin soft after a shower too! A water softener works by taking out the minerals (magnesium and calcium). When the outside water enters through it, the hard water goes through the resin bed, it removes the hard ions and adds soft ions. This results in only the “softened” water entering your homes plumbing. This is all done with salt. When the resin bed fills with the hardened minerals, it needs to be cleaned out and the salt is replaced with new. A water softener not only removes the hard minerals, but it can be said it “cleans” your water too. If you want clean drinking water, you can also install an RO (reverse osmosis) water filter. An RO water system can be installed under your kitchen sink with its own water dispenser. An RO water system filters out any further chemicals and turns the water into super clean drinking water. Many bottling companies use RO systems for bottled water and carbonated beverages. An RO water system can be installed in a couple hours and NO MORE BOTTLED WATER TO BUY AND LUG AROUND! 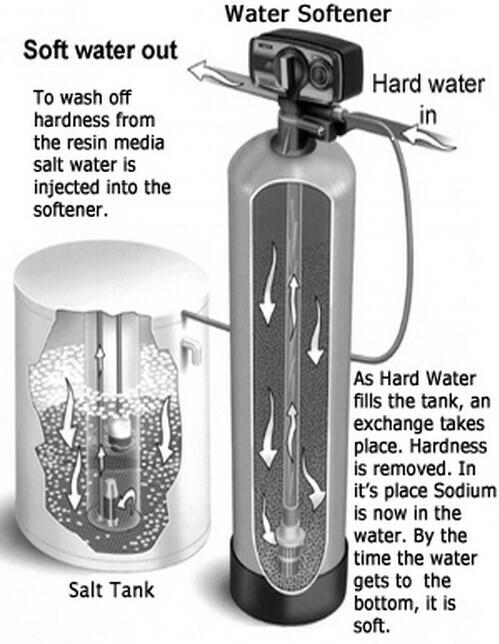 How A Water Softener Works! Here are some companies that are the top in the business for water softeners… Kinetico, GE water softeners, ECOwater, Whirlpool, Pelican Water, Charger Water, and Water Boss. If you know of some other great companies that specialize in water softeners, please leave a comment below. I had no idea there were different types of water. Our water is considered “hard water” but I had no idea until my friend showed here. She mentioned that we could get a water softener to “soften” the water. I was a little confused because water isn’t hard or soft. Now I get that it just means the minerals are removed. Isn’t it good to have some minerals in our water, as long as they are good minerals in a safe quantity? I would love to get rid of all the hard water spots that stay on the faucets and sinks. I mean, I’m so tired of the holes in the shower head getting clogged up in spraying in random directions, but I’ve never understood why people insist on only drinking purified water. I mean, even pure mountain spring water has minerals in it! Hard water is definitely something you never get used to. As you say, there’s water spots on everything, and you lack that clean feeling when you’re showering, etc. I haven’t installed a water softener yet because I wasn’t sure it would do much for me, but you’re persuading me that it’s a good idea. I hope to see great results in my water quality. I really liked the information in this article about how water softeners can also filter it to make it safe to drink. I’ve seen revers osmosis water on the ingredient label on the back of manufactured drinks. I know that it’s a method used to filter water, but I didn’t know that it can also remove hard minerals. So, if I installed an RO water filter, does that mean that I’ll be able to safely drink the water coming out of my shower head? Sometimes I feel thirsty in the shower, so it would be nice to be able to drink straight from the shower head if it’s safe. No. Drink the filtered water from the RO only.